Recordings from the picket lines, at the marches and in the soup kitchens during the 1984 miners’ strike. In 1984 a group of independent film and video makers decided to show their support for the miners' strike using the tools they had available: their cameras. On the picket lines, at the marches and in the soup kitchens, they recorded the testimonies of the striking miners, their wives and supporters, in a fight against anti-strike propaganda dominating the mainstream media. 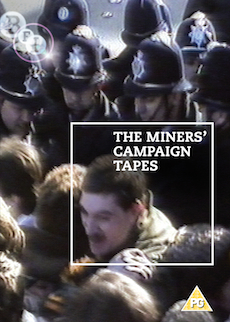 A testament to solidarity and activism, the tapes tackle issues which continue to occupy us today: the right to demonstrate, police tactics, political double-speak, the role of the media. They are a crucial document of a cataclysmic episode of British history. 6 Only Doing Their Job? llustrated booklet with essays by Chris Reeves, in which he discusses the making and distribution of the Tapes, and by Professor Julian Petley, author of Media Hits the Pits: the Media and the Coal Dispute (1984) and contributor to Shafted: the Media, the Miners' Strike and the Aftermath (2009).